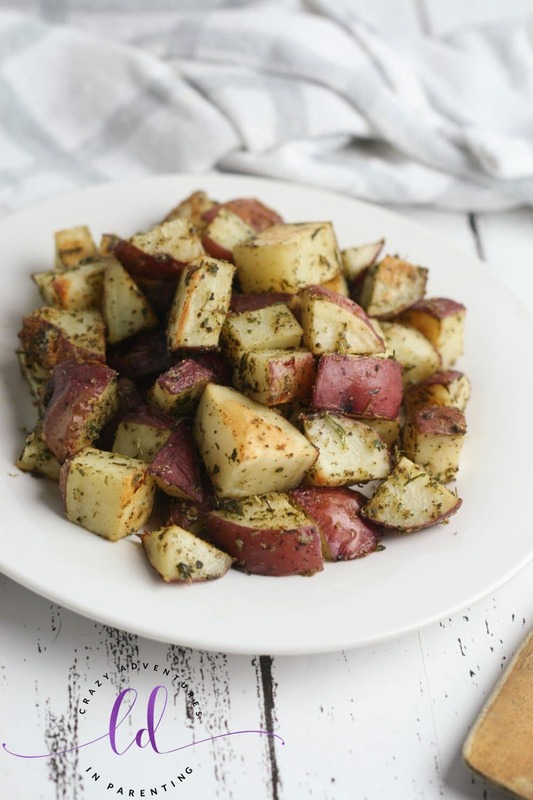 If you need a delicious side dish for dinner, look no further than these delectable Italian Herb Roasted Potatoes! Just a few ingredients for this easy potatoes recipe! These Italian Herb Roasted Potatoes are one of my most favorite potato recipes to make! I can honestly tell you that, as obsessed as I am about mashed potatoes, these roasted potatoes are right up there as far as obsession level. They are truly THAT good. This is a recipe I can each to again and again, you know? Better than what you get in the restaurants! Paired with a fantastic steak, roast chicken, or a fantastic rack of barbecue ribs, this easy potatoes recipe really adds something wonderful to any meal! If you’re in need of an easy-to-please side dish, then look no further! This Italian Herb Roasted Potatoes side dish pair so well with practically anything you can imagine! Steak, chicken, pork, fish – the possibilities are endless! I love making these in the oven on a sheet pan since it frees up the stove to make vegetables and more! Sheet pan meals and side dishes are my favorite! I plan to delve into more our our favorite sheet pan recipes in the coming weeks and months! I love a good easy recipe, and this potato recipe is as easy as they come! Combining a few spices with chopped red potatoes, and you’ve got a magical sheet pan side dish ready to grace your table for any dinner you’ve got cookin’! Red potatoes are my favorite ones to use for dinner, they’re just so delicious and they retain their shape so beautifully when preparing them! I reach for red potatoes for almost every potato dish I make! My children absolutely adore roasted potatoes any time! We never have leftovers left after we make this recipe, my kids constantly gobble these up like they’re going out of style! If you need a kid-friendly potato dish, this is truly it! Kids of all ages love this one so much! We’ve got quite a few kid-friendly variations on this awesome potato side dish recipe that I intend to share with you in the coming weeks! The funny and most interesting thing about these potatoes is the fact that they are light! They’re only sprayed lightly with olive oil cooking spray instead of drizzled. Since we’re going light on the oil (essentially spraying enough to cover the potatoes so that the herbs stick well to ’em), they aren’t overly fatty (even though olive oil is considered a good fat) and, as a result, this Italian Herb Roasted Potatoes recipe is only three Weight Watchers Freestyle points for every ½ cup serving. Amazing! The beauty of this recipe is in its simplicity. One bowl, one baking sheet, a few steps and ingredients, then BAM! Before you know it, you’ve got a wonderful tasting side dish recipe for dinner time that tastes far more elegant and complicated than what you did to prepare it! Such an easy peasy recipe! That’s how I like it! The easier the better, especially during the week with school and work, you know? I still want everything to taste amazing, just be easier on my time and effort, you know? Work smarter, not harder. That’s my motto! The great part about this recipe is that it’s easily duplicable and double-able! While making this for dinner one night, go ahead and make extra and use the second batch for another future dinner, perhaps a casserole that calls for potatoes? Heck yes! Or if you’re serving a crowd, this is absolutely one of those recipes people love and ask for the recipe! We’ve repurposed this recipe for a good old fashioned breakfast hash! We also made a mean chicken pot pie using these Italian Herb Roasted Potatoes! There are so many things you can do with these! Preheat oven to 350 degrees. Spray your baking sheet with the olive oil cooking spray and set aside. Dice your potatoes into less than one inch pieces on a cutting board with a Chef’s knife. Place the diced potatoes into a large bowl. Spray with olive oil cooking spray, coating all of your potatoes. You might need to toss them a bit to ensure they were covered. Season the potatoes with the Italian seasoning, parsley flakes, salt, garlic powder, and black pepper. Stir with a wooden spoon, gently tossing as you stir, to ensure every potato is seasoned well. Place potatoes on your greased baking sheet in a single layer so they will bake evenly. Bake for about 30 to 40 minutes, stirring halfway through to ensure even coverage. Potatoes are done when they are golden brown and crispy on the outside but fork tender on the inside. Let cool slightly before serving. Enjoy! Full recipe with measurements can be found below! I hope you love this recipe! Please let me know how your family enjoys it should you make it for them (or for yourself)! Also, if you’re a huge potato lover as I am, check out my other potato recipes on this site along with other side dish recipes! And be sure to follow my Potatoes, Oh My Pinterest board for lots of potato-themed lovin’ there! Check out my friend Mel’s fantastic idea for a Mashed Potato Bar! Spray your baking sheet with the olive oil cooking spray and set aside. Dice your potatoes into less than one inch pieces using a sharp Chef’s knife. Place the diced potatoes into a large bowl and spray with olive oil cooking spray, coating all of your potatoes. You might need to toss them a bit to ensure they were covered. Season the potatoes with the Italian seasoning, parsley flakes, salt, garlic powder, and black pepper. Stir with a wooden spoon, gently tossing as you stir, to ensure every potato is seasoned well. Bake for about 30 to 40 minutes, stirring halfway through to ensure even coverage. Potatoes are done when they are golden brown and crispy on the outside but fork tender on the inside. Each ½ cup serving is 3 Weight Watchers Freestyle points.